Up at 7am we had a walk with Mr Grey and the others – two Manchester DA lads, returning afterwards to an excellent breakfast. The morning was fine, but cloudy, as we started (9.30) and we rode down by the lake with the other two, Mr Grey having to return home for work on Sunday. At Llanuwchllyn came the parting of the ways, they going via Bwlch-y-Groes to Aberystwyth, and we to Dolgellau. I have never seen the mountains in such a savage forbidding mood before, the ragged peak of Rhobell Fawr (2313ft) on one hand and the Aran’s on the other, backed by black gloomy clouds. Climbing steadily by the Afon Difrdwy, we reached Pant Gwyn, and then, in a kind of pass, beautifully wooded we came to Drws-y-Nant, and after a five mile switchback through Bont Neydd, we came to Dolgellau. Cader Idris and its lesser brothers could be seen to great advantage. As it was getting late we only stayed half an hour here, then took the Barmouth road. 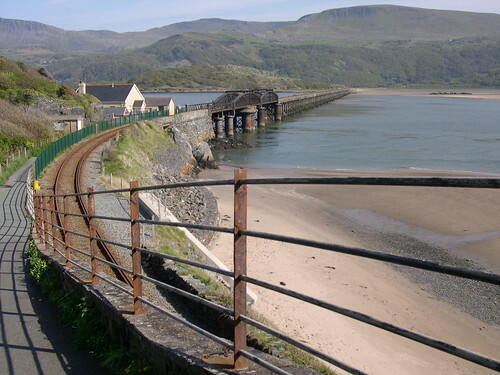 Winding by the river’s irregular course, the road in places cut through the rock, we at last after eight miles came to Barmouth with its famous viaduct. We did not stop here but joined the Harlech road. In the background stood the frowning heights of Llawr Llech and the level ground of Morfa Dyffryn towards the sea. We stopped at Dyffryn for lunch. Via Llanenddwyn we scudded, uphill to Llanbedr where we inspected the old church and had a surprise view of the sea below and Harlech Castle across the bay. Reaching Harlech Town we dumped our bikes and proceeded to examine the castle for it is sacrilege to pass a famous Castle without looking in. At 4pm we came out, and after a pleasant run we reached Penrhyndeudraeth. Up, then down, and we had an extremely level run for some miles, and a good view of Yr Eifai – The Rivals, before the hills once more closed in. Almost before we knew it, we were standing on Pont Aberglaslyn, looking down on the foaming river. As we entered the Pass we came on some sand in the road – the scene of a regrettable accident earlier this morning. One of the cyclists staying at Bettws with us last night, had skidded here and gone under the wheels of a motor lorry and was crushed to death. At Beddgelert we had tea and a look at Gelert’s Grave. Raining hard now, we started back with capes on but without caps, and entering the Vale of Gwynant, proceeded to walk. The mist was dense, the rain hard and after an extremely uncomfortable run came to Pen-y-Gwryd where some motorists were stuck in the rain. After a chat we slid to Capel Curig and on to Bettws where no rain had fallen. A big party was staying here, but the accident had veiled them all.